The Career Strategies Center helps students pursue permanent employment by creating opportunities to engage with companies and organizations on campus and around the world. We equip students with the skills needed to succeed in the ever-changing global job market and give them the chance to network with as many companies, recruiters and alumni as possible. See some of our networking opportunities below. Brandeis IBS alumni regularly host career-focused campus events for students. These have included a “Crack the Case” consulting case interview workshop with a 1997 alum who is now director of strategy and operations at Bain & Company, and a virtual session hosted by a 2017 graduate who is an analyst at J.P. Morgan. Our office partners with the Hiatt Career Center at Brandeis University for on-campus Industry Nights and other career events open to the entire Brandeis community. Industry panels often feature panel discussions, individual and group networking, and the opportunity to meet with a wide variety of employers and alumni within specific fields of interest. Past industry nights have focused on Business, Consulting & Finance, Computer Science, Biotechnology, Marketing and Social Justice. 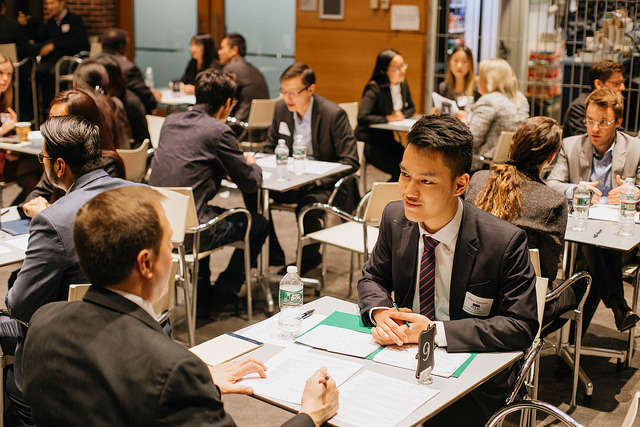 The Hiatt Career Center, in partnership with the Brandeis IBS Career Strategies Center and other groups across campus, also hosts a "Just in Time" Career Fair each spring for students to meet with employers and recruiters on campus.